The Wine-O Gift Guide – Gotta Have It For Valentines Day! I have found the perfect gifts for the wine-o in your life! Trust me if that special someone you are purchasing for loves wine this is the gift guide for you. I gotta have everything on the list! I can't pick a favorite between the wine of the month club and the wine barrel cork cage. Finally a Gift Guide for the rest of us. You know who you are… you love a glass of red wine after a long day at work, a glass of white on a crisp summer day, and there's always a bottle of bubbly for when the girls come over. I tried to hit all different price ranges so there is something for everyone. How awesome is this? A wine case that fits the bottle, a couple glasses, and a corkscrew. Perfect to have along on a little travel excursion! This could have come in quite handy this past year! Not a fan of red wine? You might want to check out the Corkcicle Classic Wine Chiller, no more waiting for your wine to cool. If you're like me you might have a ton of corks you don't know what to do with or aren't creative enough to make some of the crafts you see on Pinterest. Hard to decide which cork cage I like better, I think the wine barrel is my favorite! 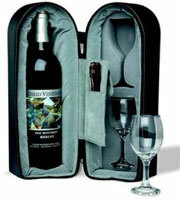 Wine Travel Carrier & Cooler Bag – Chills 2 bottles of wine or champagne. This would be great for bachlorette parties, the The WineRack 200-008 The Wine Rack! I can't help but laugh. To match the wine rack a Wine Clutch will do the trick. Always be prepared! 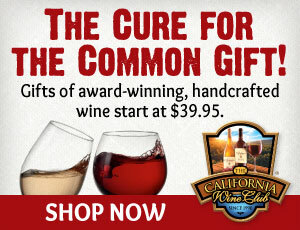 First Three Months 50% Off at the California Wine Club! Use code Share50for3 for this fabulous savings. I love this gift idea, who wouldn't love monthly wine deliveries?! Whether you need a last minute gift or have a couple days to order this WIne-O Gift Guide has you covered!